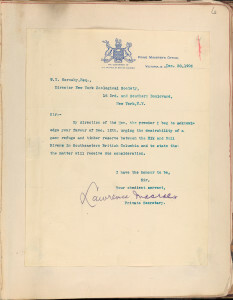 Letter from Lawrence Macrae to Hornaday, Dec. 20, 1906. Hornaday Wildlife Scrapbook Collection, Vol. 1. WCS Archives Collection 1007. 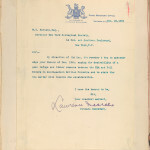 Since the last name was difficult to read, a search was performed for private secretaries to the Prime Minister around the time period in question. The results yielded claims that Macrae, the private secretary to Prime Minister Richard McBride, was a German spy. 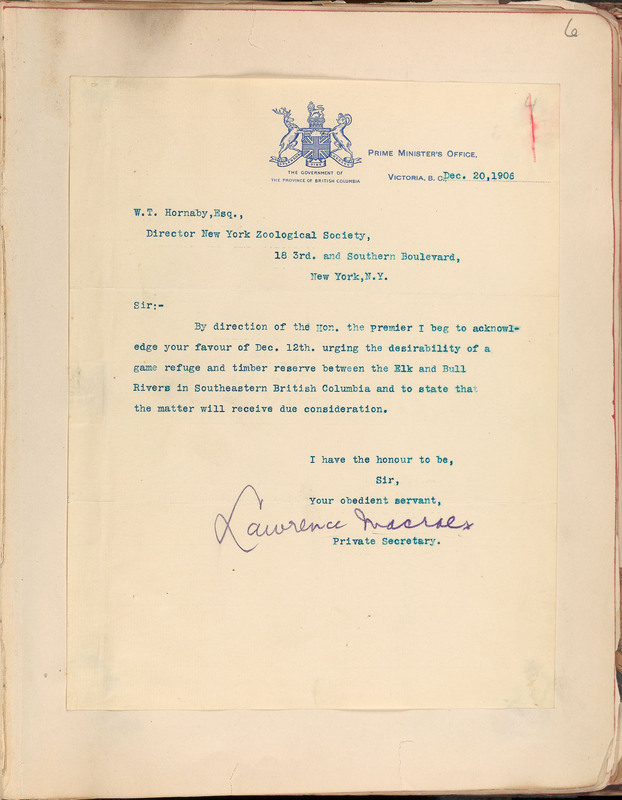 Macrae committed suicide on September 10, 1914. According to Patricia Roy’s Boundless Optimism: Richard McBride’s British Columbia, rumors quickly circulated that Macrae did so after he was caught stealing and manipulating defense plans. McBride, however, quickly came to Macare’s defense, claiming that he had been suffering with a nervous ailment for many months prior. When cataloging a scrapbook on wildlife protection, rumors of espionage are not something someone assumes they’ll encounter. But you really never know what you may find! This post is by Sarah Cassone, who worked during Summer 2013 with the WCS Archives as a Metadata Cataloger on our Hornaday Wildlife Protection Campaign Scrapbook Project. Interesting, Steve! We haven’t run into this one yet. We’ll have to do some digging and get back to you–possibly another blog post!